BEIJING (AP) — China’s unmanned spacecraft Shenzhou 8 blasted off Tuesday morning, in the latest step in what will be a decade-long effort by the country to place a manned permanent space station in orbit. 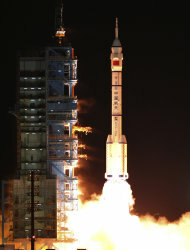 The spacecraft took off from a base in the far western city of Jiuquan, the official Xinhua News Agency said. Minutes later, Xinhua cited Chang Wanquan, who leads China’s space program, as announcing the launch a success. China launched its own space station program after being rebuffed in its attempts to join the 16-nation International Space Station, largely on objections from the United States. The U.S. is wary of the Chinese program’s military links and the sharing of technology with its chief economic and political competitor. Earlier Chinese news reports did not specify a launch date for Shenzhou 8. Chinese space officials rarely speak to foreign media. The Shenzhou 8 will attempt to dock with an experimental module, carrying out maneuvers to couple with the Tiangong 1 module now in orbit. The 8.5-ton, box car-sized Tiangong 1 launched last month. Following Shenzhou 8, two more missions — at least one of them manned — are to meet up with the module next year for further practice, with astronauts staying for up to one month. Plans call for launching two other experimental modules for more tests before the actual station is launched in three sections between 2020 and 2022. At about 60 tons when completed, the Chinese station will be considerably smaller than the International Space Station, which is expected to continue operating through 2028.